"Don't call us MPs. Call us advisers to the people," the ochre-robed Buddhist monks tell a gathering of devotees at a temple on the outskirts of the Sri Lankan capital, Colombo. "You have given us strength by electing us." The crowd erupts in applause, as six elected monks sit on a platform flanked by a giant granite rock statue of Buddha on a muggy evening. It is a celebration for the winning monks who contested last Friday's parliamentary elections. Some 280 monks took part in the vote - the first time such a large number of clerics have stood for election in this predominately Buddhist country. They came together under the banner of the National Heritage Party - the first all-monk party, which will have nine seats in the new parliament. For the six young monks, it was an evening of glory as they walked in a procession under colourful umbrellas with devotees showering petals on them. Then they took the stage for the celebration amidst Buddhist chants. But this was no religious ceremony. "We are going to be a deciding factor in propping up the new government," said elected monk Venerable Athuraliye Rathana, who was soon mobbed by television crews for his take on the political situation. Earlier, the tired, but happy-looking monks arrived at the 46-year Vajiraghana temple and mingled with the people. After addressing some 20 public meetings over the past month, Venerable Uduwe Dhammaloka, 35, one of the winners, looked frazzled, but ready to take on the rigours of political life. 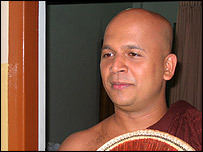 Son of a bakery owner and the first monk in the family, Venerable Dhammaloka said he decided to join politics and contest after "witnessing the damage being done to Buddhism in Sri Lanka by the rulers". "They come to power with the help of Buddhists, and then they become anti-Buddhists. They don't care about us," he told BBC News Online. But with his training as a monk, how does he plan to cope with the murky world of politics? "We have to cleanse politics in this country which is drowning in a pit. We have to jump into the pit to save the country. Then we will come out and cleanse ourselves," says Venerable Dhammaloka. He says the monks want to stay independent and support any party which agrees to Buddhist ideals. The monks say that they want to sit in parliament in a group "to raise Buddhist matters". 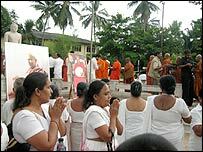 The appeal to the devout has been that Sri Lanka's Buddhism is under threat even though it is the state religion. The monks have promised "a righteous state" which cleans up politics. "It seems the success of the monk candidates has been more in the bigger cities and urban areas. It's not that they have done well in rural areas or Buddhist places," says analyst Rohan Edrisinha. "Their votes seem to have come from the middle class." 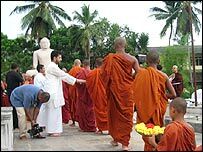 The popular perception is that the success of monks in the elections has more to do with some people being disillusioned with mainstream politicians in the country. "The Buddhist monks did unexpectedly well"